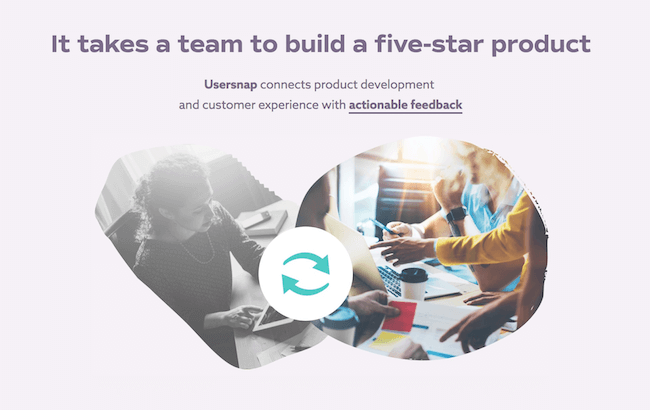 Because user feedback is important not just for product development teams, but for other departments as well, we are thrilled to introduce USERSNAP CX today. Usersnap CX helps you to collect customer feedback, and get insights on customer satisfaction with quantitative metrics (such as NPS or CSAT). You probably have encountered the Happyornot terminals placed at airports asking for your Smiley-rating. We are taking the Happyornot experience into the digital worlds allowing companies to ask for feedback inside their products and on their websites. For those, who use feedback for their product development, you are able to find our original product from now on as USERSNAP CLASSIC. We wanted our new brand design to reflect the exciting changes that are happening at Usersnap: we have evolved from a developer-focused product to creating solutions that are used by development, product and innovation teams around the world. The new Usersnap is rich in colors, has bold typefaces, new fonts, and expressive images. We ❤ our new design and hope you do too! We are like proud parents and could talk about your new product and design forever. But now it’s your turn to check out our new baby! ? Visit our new website and leave some feedback on our site, using the feedback button on the bottom right corner. ? Cheers and thank you for being part of Usersnap! PS: Let us know what you think about our new branding.